CFH Docmail Ltd, a UK based transactional and mailing printer, has signed a five-year contract with Canon for an Océ ColorStream 6000 Chroma continuous inkjet web press. This contract, which is worth £3 million, resulted from a competitive two-year Request for Proposal, or RFP. CFH Docmail has invested in a Canon Océ Colorstream 6000 Chroma continuous feed inkjet press. The ColorStream 6000 Chroma uses new high definition Chromera inks that produce high quality images across a broad range of different media. 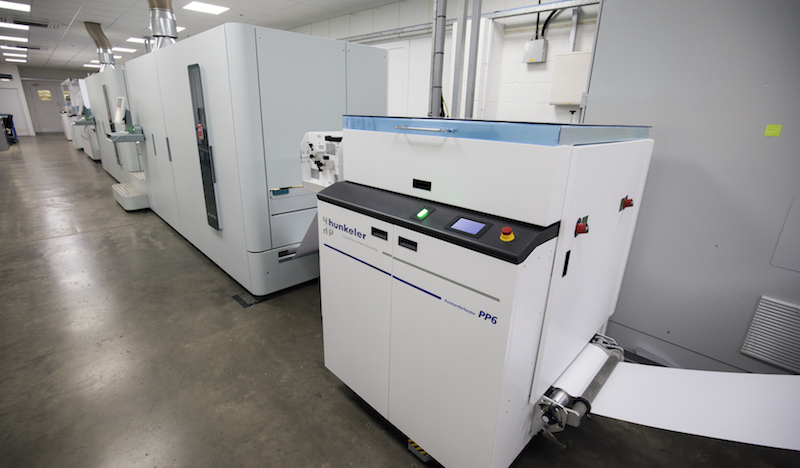 The press allows users to switch quickly between mono and colour inkjet jobs using the same white paper stock. It supports MICR inks and has all the necessary accreditation for secure printing including cheque infill and cheque personalisation. CFH has developed its own hybrid mail management solution, Docmail, which was launched back in 2008. This allows post to be printed and delivered direct from a desktop computer. Users upload their documents via a website to the company’s servers. CFH then prints and sorts them, the aim being to produce and deliver documents in the most cost-effective way, exploiting economies of scale and mail sorting discounts. The service is continuing to grow, with Harwood saying that there is “a good pipeline of new opportunities and lots of new strategic alliances” including things such as providing a framework for government purchasing. The company headquarters and main production facility is in Radstock, near Bath. There are further production sites at Slough and Livingston in Scotland. You can find further details at the CFH website.